With the warm weather we are enjoying it is important to consider the hazards to children with windows. Every summer there are a spike of fall injuries of children when we open windows up to let fresh air in. Window screens have warnings on then informing consumers that the they are not to be considered fall safety devices. Most screens will come dislodged or tear with only moderate pressure. The view and fresh air are very appealing to young children. The Consumer Product Safety Commission estimates that there have been 3200 children treated in hospitals and 25 deaths in 2007 from window falls. These accidents are easy to prevent. 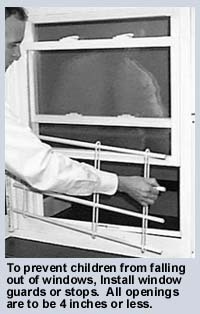 All windows should have safety stops or barriers to prevent children from falling out of windows. These should be easily removable by older kids and adults in case of fire. Any window that opens and children have access to should be considered a falling hazard. No window that is accessible to children should open more then 4". Many parents make the faulty assumption that a window screen will prevent this kind of accident. Where a window can be opened from the top and bottom, always open only the top. 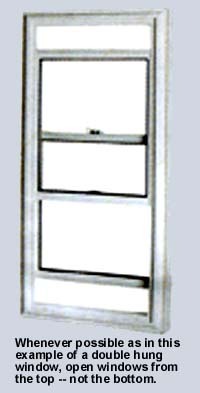 It is much safer to open the top of a double hung window. Never keep furniture near a window that a child can climb on and gain access to a window. your local independent Greater Seattle area home inspection team.